Description - Our Geo Accents Carpet Tiles are one our premier carpet tiles, and features 12 bright and distinct colors that allow you to create interesting and distinct patterns. These floor tiles have been constructed of 40% post-consumer recycled material and are produced with 100% recycled energy, making them a very ‘Eco-Friendly’ product. These tiles are also very easy to install, needing only double-sided tape or a pressure sensitive adhesive. For most residential installations, double-sided tape is all that is needed, but for a more permanent solution, a pressure sensitive adhesive would be required. Not only are these residential carpet tile squares easy to install and maintain, they also been treated with a unique proprietary system that allows them to dissipate odors in any room the tiles are installed. So if you are looking for a product that is not only durable but is environmentally friendly, then our Geo Accents carpet tile is for you. Material - Constructed with post consumer recycled materials and Nexus backing. 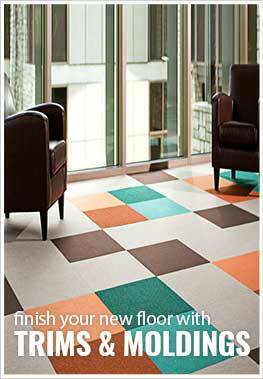 Tiles are stabilized with a fiberglass reinforcement layer, are phthalate free and CRI Green Label Plus certified. Weight - ~0.75 Lbs. per square foot. Recommended Uses - Our Contemporary Carpet Tile squares have been used in both commercial and residential applications because of their durability, versatility and ease of installation. Because of these facts, carpet tiles are quickly replacing broadloom carpet and have been installed in nurseries, basements, kitchens, bedrooms, weight rooms, home gyms, garages, workout rooms, and elderly care rooms and many other areas. In wall to wall installations, tiles can be adhered with double-sided tape or you can use a pressure sensitive adhesive for a more permanent hold. You would apply the adhesive with 1/16" x 1/16" x 1/16" V notch trowel at minimum. For commercial or permanent installations, the use of a pressure sensitive adhesive or acrylic adhesive would be recommended to keep the tiles in place. Again, you would use at minimum a 1/16" x 1/16" x 1/16" V notch trowel to apply the adhesive. Helps reduce odors in rooms.